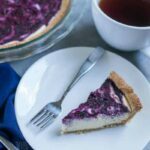 I needed to find a recipe to use up some frozen blueberries. We’ve been hoarding them in our freezer for almost two years. So, it’s time to use them up. We pick a lot of blueberries over the summer because a friend invites us when his blueberry bushes are producing. It’s way too many berries to eat at once. Most of them end up getting frozen. 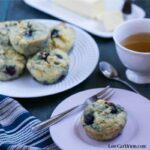 I used to make a blueberry syrup to use on pancakes, waffles, or mix into plain yogurt. However, I’ve been trying to cut back on natural fruit sugars. 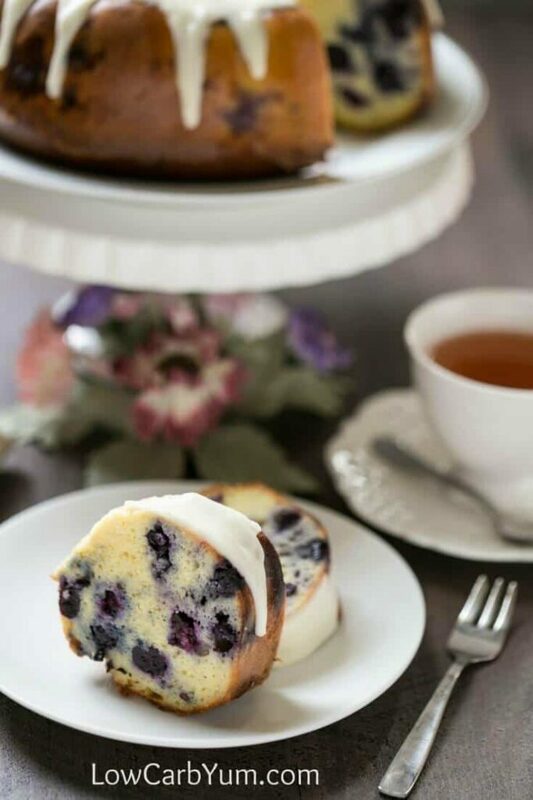 While looking for a recipe, I stumbled upon a few lemon blueberry pound cake recipes. 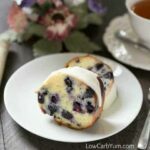 That gave me the idea to use an old pound cake recipe from my strawberry shortcake post and adapt it to use blueberries. I ended up doubling the ingredients for the pound cake and added two cups of blueberries. Then, dumped it into a silicone bundt pan. 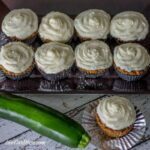 I had actually bought the silicone pan last year, but never used it. This was the perfect opportunity to test it out! Doubling the original pound cake recipe was the perfect amount for the bundt pan. 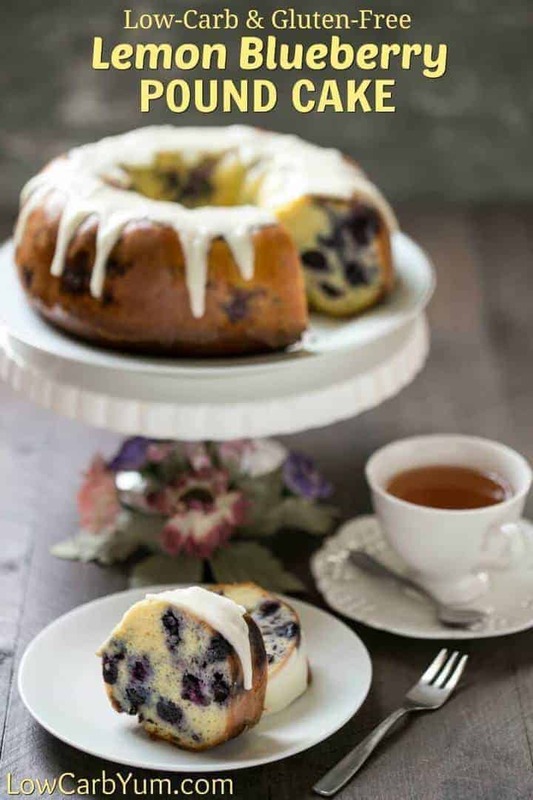 And, the low carb lemon blueberry pound cake released from the ungreased pan with ease! I was very happy about that. I’ve had trouble with low carb cakes sticking to regular metal pans so I’ve invested in several silicone ones. I knew the cake would need to be dressed up a bit with a glaze. 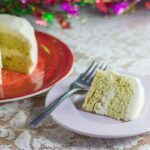 Low Carb Maven recently posted a low carb bundt cake, so I took a quick look at that recipe for some inspiration. However, I wanted a thicker glaze so I reduced the amount of lemon juice. 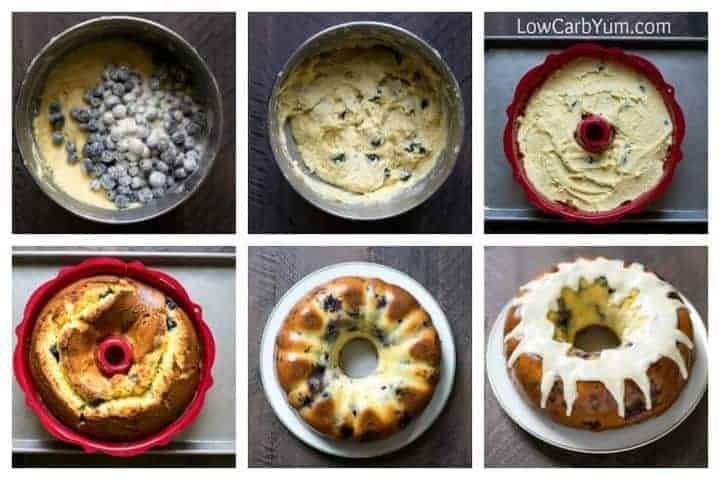 My low carb lemon blueberry pound cake recipe came out perfect after the first try! I’m definitely going to be making this one again. 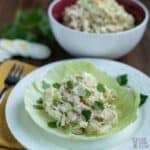 It’s perfect for a holiday brunch or gathering with family and friends. You get sixteen good sized pieces from the cake. Not only is this a gorgeous looking bundt cake, it’s got a great texture and isn’t dry. The flavor is terrific too. 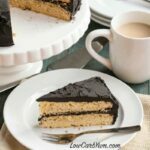 I bet no one will be able to tell it’s a low carb and gluten free treat. 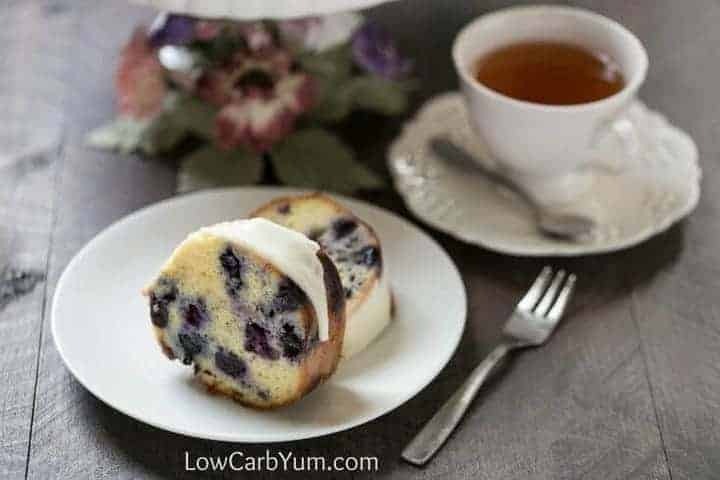 Because I got so much from this low carb lemon blueberry pound cake recipe, I froze about half of it for later. So, don’t be put off by the amount of cake you’ll get. 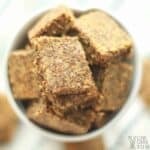 You could always cut the recipe in half and bake it in a 9×5 loaf pan if desired. I thought about bringing in half of this cake to share with my coworkers. But, it was so yummy, I wanted it all for myself. I’ll make another one to share later this year when I get together with family and friends. There’s still tons of blueberries in my freezer. I just need to stock up on more almond flour. 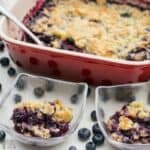 Another one of my favorite low carb recipes to use up blueberries is my easy blueberry cobbler. 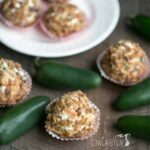 It’s one of my favorite summer treats and it goes perfectly with a scoop of low carb vanilla ice cream on top! Have company coming or need something for a special brunch? 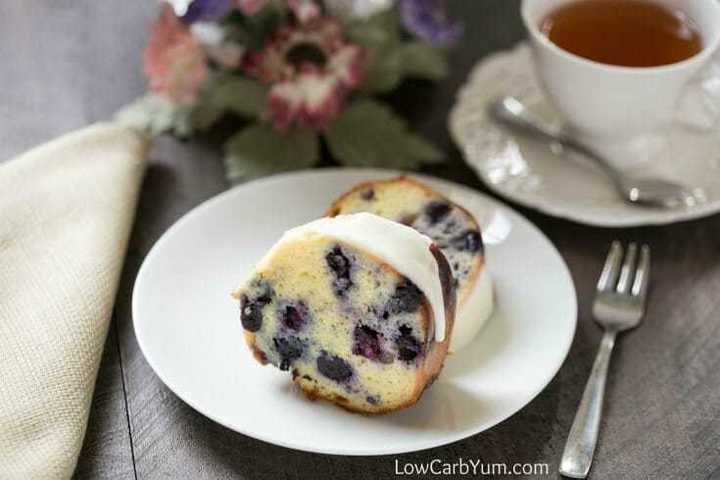 This low carb blueberry cake recipe is sure to please all! Cream together the butter, cream cheese, and sweetener. 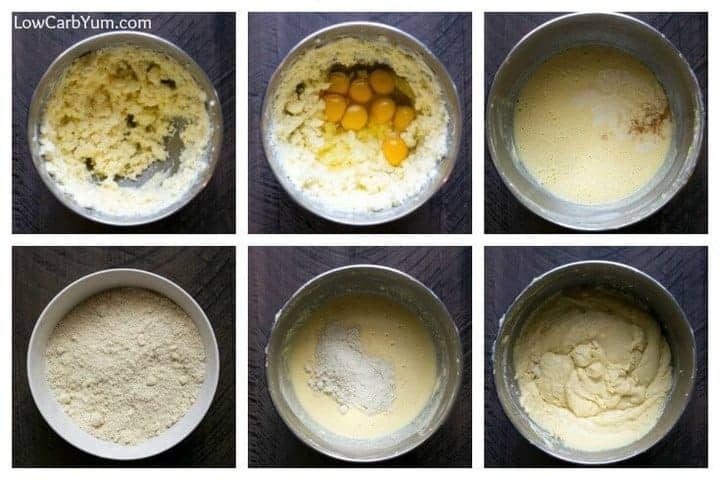 Blend in the eggs and then the extracts. In separate bowl, combine the almond flour, coconut flour, and baking powder. Slowly stir in the flour mix into the egg mixture. 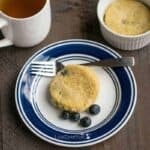 Coat blueberries in coconut flour, then stir into batter. Pour batter into a greased tube or bundt pan (I used an ungreased silicone pan). Bake at 325°F for 1 hour 15 min to 1 hour 25 min or until toothpick inserted near center comes out clean. For glaze, stir lemon juice into powdered sweetener to desired consistency. Drizzle over cooled cake.